This artist's illustration depicts the vintage International Sun-Earth Explorer 3 (ISEE-3) spacecraft. A 36-year-old spacecraft controlled by a private team nearly performed an engine firing Wednesday (June 25) to increase its spin, but the maneuver was called off due to concerns that the probe did not receive all commands. NASA’s International Sun-Earth Explorer 3 probe, controlled by a group that calls itself the "ISEE-3 Reboot Project," is expected to be redirected to a more advantageous orbit for Earth communications next week. But first, the team needs to increase the spacecraft’s roll very slightly. Operators were working out of their control center in California (an abandoned McDonald’s in Silicon Valley, near NASA's Ames Research Center), directing their commands through the powerful Arecibo Observatory radar dish in Puerto Rico. "We are waiting for word of our next window at Arecibo," the update continued. "We are now confident that we will be able to perform the required thruster firings to spin up the spacecraft during the next opportunity." Once the spacecraft is spinning fast enough, the main engine burn will take place — likely between June 30 and July 2. On Wednesday, controllers planned to use NASA's Deep Space Network to get a more precise fix on where the spacecraft is located. The aim of the engine burn is to park the spacecraft in an orbit where it can easily be reused, although for what purpose is unclear. In previous interviews, ISEE-3 Reboot co-leader Keith Cowing said the team is focused on moving the spacecraft and will decide on its next use after making sure the probe is functional and in a correct orbit. ISEE-3 was launched in 1978 and has served as a comet chaser, sun monitor and more. It was put into hibernation in 1997. 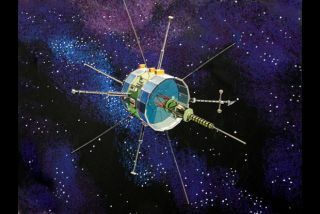 The ISEE-3 Reboot team is the first private group to ever take control of a NASA spacecraft, which is allowed under a Space Act Agreement the project has with the space agency. Additionally, the ISEE-3 Reboot Project has raised more than $150,000 from crowdfunding to buy telescope time and defray travel costs for team members.